Whirled is large social Flash world, full of multiplayer games, avatars, toys, rooms, furniture and all the usual kind of things you’d expect from a Flash MMO. Think Gaia / Habbo only looking like the complete visual mess of a typical MySpace page. Whirled run a developers competition. You can modify your game to work within the “Whirled”, upload it and be in with a chance of winning some real money. What’s more your game is up for sale in their shop, which means that other Whirled players can buy it and add it to their rooms, and you get a cut of the revenue generated by this. 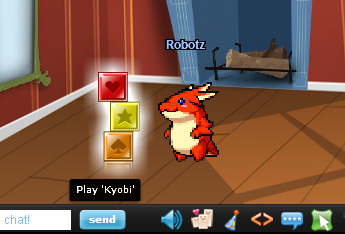 After some sweet talking by Chris of FGL I decided to port Kyobi to the Whirled platform. Believe me, it was not an easy task. The Whirled API is very easy to use, but the fact you are locked out of referencing the stage was quite a shock. When I went through my code and realised just how much I rely on it, and things it inherits (like mouse coordinates, width references, etc) it nearly put me off converting the game at all. But I perservered and after a lot of trial and error, I finally managed to get it working! I don’t expect to win the competition, but the more I worked with Whirled the more I liked its anarchaic and freeform nature. If I create a new Whirled game it’ll definitely be written to take advantage of their system from the start, not applied at the final stage! Posted on March 31st 2009 at 6:33 pm by Rich. Thanks for sticking with it and adding your game!